Alpha-1 antitrypsin (AAT) deficiency is a common monogenic disorder resulting in emphysema, which is currently treated with weekly infusions of protein replacement. We have reported achieving plasma wild-type (M) AAT concentrations at greater than 2% of the therapeutic level at 1 and 5 years after intramuscular (IM) administration of 6 × 1012 vg/kg of a recombinant adeno-associated virus serotype 1 (rAAV1)-AAT vector in AAT-deficient patients. This persistent expression was associated with a regulatory T cell (Treg) response to AAV1 capsid epitopes in the absence of any exogenous immune suppression. The patients also showed partial correction of functional biomarkers of AAT expression, including an increase in antineutrophil elastase capacity and a decrease in markers of neutrophil degranulation. Muscle-based gene therapy has allowed us to avoid targeting the liver, therefore preventing potential toxicity in patients where the hepatocytes are burdened with mutant AAT protein. 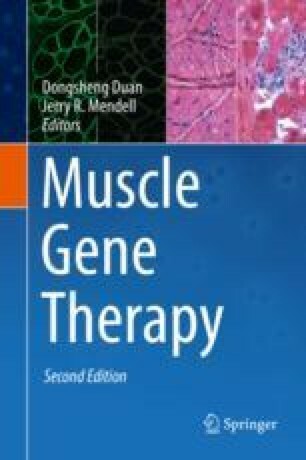 Future muscle gene therapy will likely require dose escalation using a limb perfusion delivery method in order to obtain therapeutic serum levels of AAT while still avoiding delivery to the liver. This work was supported in part by grants from the NIH (P01HL131471).